When I first heard that P.D. James would be writing a sequel to Pride & Prejudice I was excited, but skeptical. I love Jane Austen and P&P is a particular favorite of mine. I always have a copy available to me. Once, when I returned to my college campus a few days early to avoid a winter storm I hiked a mile through the snow to get to the Odyssey Bookshop to buy a spare copy of Pride & Prejudice because mine was locked in my inaccessible dorm room. I got the Dover edition, in case you’re curious. I have owned 3 copies of the 6-hour BBC miniseries (VHS, DVD, and the Anniversary edition of the DVD). Needless to say, I’m a big fan. I have tried other Austen sequels in the past. Some have been better than others. The Carrie Bebris mysteries are decent. I quite enjoyed Pamela Aidan’s Mr. Darcy series. On the other hand, I found Mr. Darcy Takes a Wife entirely too salacious for my tastes. I know several people who love it, but it wasn’t for me. I’ve even read Lady Catherine’s Necklace which focuses on Lady Catherine de Bourgh rather than Elizabeth and Darcy. But those were other authors. Authors I didn’t know outside the context of Austen sequels. This was P.D. James whose mysteries I had enjoyed in the past. I had expectations. Expectations can be dangerous, especially with me. I am, I’m afraid, not a forgiving person when I’m disappointed. It’s a character failing, but one I am familiar with. I will rail against the mistakes of a favorite where I might forgive an unknown. When an author has developed a reputation for excellence with me I do not tolerate anything less. So I was trepidatious. P.D. James, on the whole, came through for me. She started the book with a very modest apologia. Jane Austen, she opined, would not really have approved of her book. Austen did not like to dwell on the unpleasant, and murder is nothing if not unpleasant. But, James wrote it anyway, with apologies and acknowledgements that if Austen had wanted to write a murder mystery then she darn well would have written a better one than this. I found the author’s introduction charming. And I was in the mood to be charmed. Death Comes to Pemberly takes place six years after the close of Pride and Prejudice. James fills in a few of the details for those who do not remember their Austen perfectly, but doesn’t overdo it. She spends more time on Mr. Collins and his absurdities than she does on the back and forth between Darcy and Elizabeth. As one who remembers P&P faithfully, I appreciated this. The action takes place on the day before a major ball at Pemberly. Jane and Bingley have come to join Darcy and Elizabeth. Georgiana and Colonel Fitzwilliam are all in residence, as is a young barrister from London who is a guest of the Bingleys’. A quiet family evening is shattered when a carriage races up the drive and Lydia Wickham falls out of it into Jane’s arms screaming that Wickham has been murdered in the Pemberly woodland. Death has indeed intruded into the peace of Pemberly. James does justice to the voice of Austen. Her characters are true to themselves. Elizabeth is still wry, but tempered with the maturity you would expect of a loving mother and a content wife. Jane is still almost too good for this world, while Bingley is his affable self. Lydia is the vain, shallow idiot she has always been. Marriage with Wickham could only reinforce her bad points. Darcy and his cousin are the most changed. In Darcy we see the landowner and family man who is, for the most part, only hinted at in P&P. Fitzwilliam, on the other hand, has inherited the title that was earlier held by his older brother. He is very aware of his own consequence and has become in truth the overly prideful man that Darcy had been in appearance. Even Mr. Bennet and Mrs. Bennet’s nerves make cameo appearances much to my delight. Several new faces from the Pemberly estate are introduced, but blend into the ensemble cast. The language and the feel of the interactions is pure regency. James stays true to period to a remarkable degree. Death Comes to Pemberly is not, at its heart, a mystery novel. No one really detects. There is a death, an inquest, and a trial. But there is not a detective. No one collects clues as such. The solution to the murder is not winkled out piece by piece, but revealed in its entirety at the end of the story. This does not detract from the novel, but it is important not to go into the story expecting a who-done-it or a police procedural. On the whole, I very much enjoyed the book. But I wouldn’t be me if I didn’t have one or two minor issues. The first is that James can’t quite keep herself from winking at the future. There are two or three points at which a character laments the lack of some technology or reform that is unavailable to them. During the initial medical examination of the victim the magistrate bemoans the lack of blood typing methods that won’t be invented for almost a century. At another point, Mr. Alveston, the London barrister, laments the fact that prosecuting council has more power in the courtroom than does defense council. Again, this is something that was reformed following the events of this novel. I fail to see that either of these anachronistic asides was particularly important. Perhaps they were preemptive, to avoid confusing a reader who was more familiar with modern forensic practice? I’m not sure, but I found them slightly jarring. My other primary complaint was that James chooses to link characters from this novel with other characters from the Austen cannon. Wickham, for instance, served for a time as the secretary to Sir Walter Elliot from Persuasion. I’m not sure that I agree with that. Austen herself never created cross links between her books. Again, I found it slightly jarring. It seemed a bit too much like the author was nudging me in the ribs and checking to make sure I’d seen the clever thing she had just done. The rest of the novel is so seamless that these few moments stand out in my mind. They are minor and don’t really create a major impact on the integrity of the novel. They just rub at me. But then, I’m like that. 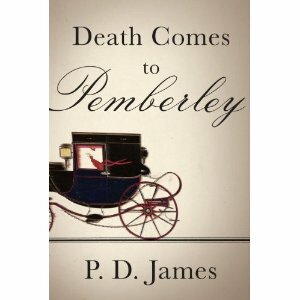 Death Comes to Pemberly is well crafted and highly entertaining!